Below are some acupuncture FAQs. If you have any other questions, please contact us for an informal chat. Many people come to acupuncture for help with specific symptoms or to relieve pain such as osteoarthritis or migraines. Some use acupuncture because they feel generally unwell but have no obvious diagnosis. Others choose acupuncture simply to enhance their feeling of wellbeing. Acupuncture is considered suitable for all ages. It can be used effectively alongside conventional medicine. Rita will use a number of different diagnostic methods to get a complete picture of your health and lifestyle, including taking a full medical history, reading your pulses, and looking at your tongue. The initial assessment focuses on the patient’s medical history and detecting the body’s imbalance. Based on this information, a diagnosis is formed and a personal treatment plan defined. Acupuncture points are selected according to your symptoms as well as your underlying energy pattern. The single-use fine sterile needles come in sealed packs. They will be opened in front of you and are safely disposed of after each treatment. 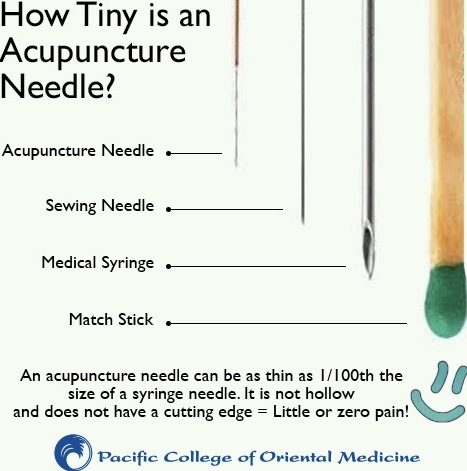 Acupuncture needles are much finer than needles used for injections and blood tests. When the needle is inserted you may feel a tingling sensation or dull ache. The needles rarely hurt when inserted and, in most cases, they are not felt at all. When the acupuncture needles are actually inserted, they are usually left in place for around 30-40 minutes. Methods of stimulating the acupuncture point, include moxibustion (application of heat), and placing a cup over the acupuncture point (cupping). Occasionally needles are manipulated to elicit what is known as DeQi. This may feel like a dull ache or a light sting. The feeling is momentary. Is acupuncture proven to work? Yes. Acupuncture is very safe in the hands of a qualified practitioner. The results of two independent surveys published in the British Medical Journal in 2001 (MacPherson et al, White et al, both BMJ September 2001) concluded that the risk of serious adverse reaction to acupuncture is less than 1 in 10,000. The needles used are single-use, sterile, and disposable. Responses to treatment can sometimes include tiredness or mild dizziness, and very occasionally minor bruising may occur. However, all such reactions are short-lived. Sometimes, if you have a chronic condition, acupuncture’s ability to shift energy can occasionally bring on what is known as a ‘healing crisis’. If this does happen, it will usually be on the first or second treatment. Your symptoms may get worse for a while, but again it’s nothing to worry about but a signal that your body is starting to expel toxins. Cupping is an ancient art practiced by the Romans, Greeks and Chinese, where glass or plastic suction cups are placed on the skin to draw out stagnation and toxins. It’s particularly good for sore muscles and fevers, however it does leave what looks like bruising on the skin. This is not painful, but can take a couple of weeks to disappear. If you have been prescribed medication we recommend you tell your doctor that you are planning to have acupuncture. Do not stop taking your medication. You should always tell your acupuncturist about any medication and supplements you are taking as this may affect your response to the acupuncture treatment. Qualified acupuncturists are trained to recognise potentially serious underlying health conditions and may refer you to your GP if they consider it appropriate. If you are pregnant, suffer from diabetes or are taking anticoagulant drugs, be sure to tell the practitioner before the treatment starts. If in any doubt at all, tell your GP before booking a session. Frequency and number of sessions depend on your individual condition. We will normally ask to see you once a week at first. Some change is usually felt within five or six treatments, although occasionally just one or two treatments are sufficient. Some people choose to have regular acupuncture as ‘maintenance’ to keep you healthy.